Configuring CentOS Linux server as a router. Iptables is a user-space application program that allows a users to configure the tables provided by the Linux kernel firewall (implemented as different Netfilter modules) and the chains and rules it stores. In other words, iptables is a tool used to manage Linux firewall rules. Iptables should come with all Linux distributions. eth1: internal (LAN) network, configured with a static IP address 10.8.8.2. The 10.10.1.0/24 network is then naturally further NAT’ed via home router to have Internet access. This is not covered here. All other incoming traffic from the public network 10.10.1.0/24 to the private 10.8.8.0/24 should be logged and denied. The image below may help to understand the network configuration. Check Linux home lab environment with VirtualBox for more info. Default gateway is on a “public” eth0 interface. Note that the source network address definition is not mandatory here. # iptables -A FORWARD -p tcp -j LOG --log-prefix "iptables_forward "
-A FORWARD -p tcp -j LOG --log-prefix "iptables_forward "
Prerouting chain helps to translate the destination IP address of the packets to something that matches the routing on the local server. This is used for destination NAT (DNAT). Now, if we try to initialise an SSH connection from the outside (eth0) network to 10.10.1.20:22043, we should be able to access the 10.8.8.43 machine on port 22. You should get the idea. Postrouting chain helps to translate the source IP address of the packets to something that might match the routing on the destination server. This is used for source NAT (SNAT). The following Puppet classes can be used as examples to manage firewall rules. 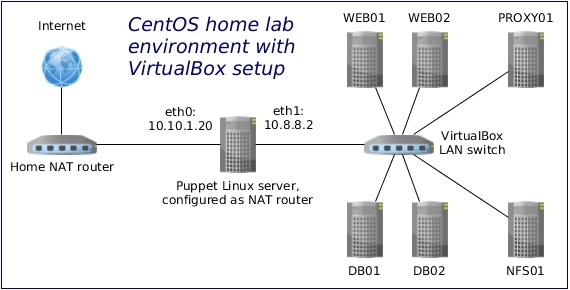 Check this blog post for how to configure a Puppet server on CentOS. This entry was posted in Linux, Networking and tagged CentOS, homelab, Iptables, postrouting, prerouting, routing. Bookmark the permalink. If you notice any errors, please contact us. Thanks for masquerade rules, these helped me a lot.